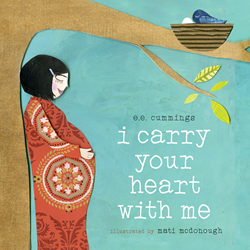 Cameron Kids, a division of Cameron + Company, is releasing a board book edition of the popular 2014 picture book, "I Carry Your Heart With Me." A children's adaptation of the beloved E.E. Cummings poem, the book is beautifully illustrated by Mati McDonough and will be available for the first time in this toddler-friendly format on Tuesday, August 22. I Carry Your Heart With Me is a children’s adaptation of one of E.E. Cummings’ most beloved poems, beautifully illustrated by Mati McDonough. In the spring of 2014 Cameron Kids released a picture book interpretation; this year we offer Cummings’ verse and McDonough’s whimsical artwork in a petite board book format, perfect for ages one to five. Showing the strong bond of love between mother and child, within nature and throughout life, Cummings’ heartfelt words expressed through McDonough’s lovely illustrations combine to create a fresh, yet classic, portrayal of love.